Founded by Teodoro Correr (d. 1830), this museum in the grand imperial rooms of the Ala Napoleonica holds the city’s vast historical and art collection. It runs hot and cold like any attic, and there is no pretense of chronological order. 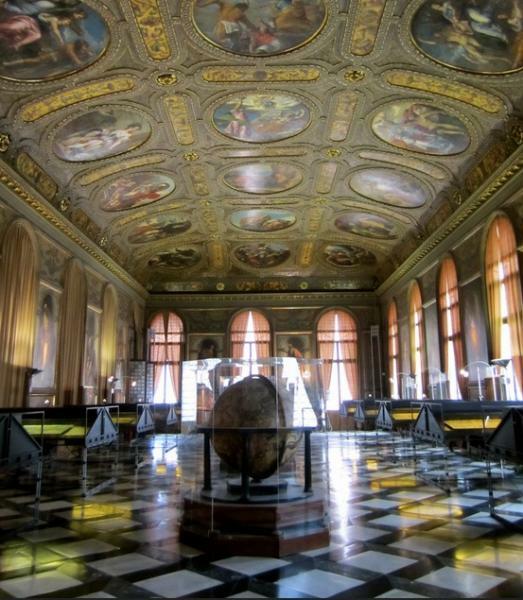 The first rooms house books, manuscripts, prints and maps, old models of ships, navigational instruments and globes, describing the history of Venice and its relationship to the sea. The grand neoclassical ballroom, dining room, throne room and others house works from the period, including plaster models by Canova and frescoes by Giovanni Carlo Bevilacqua. Other rooms on this side of Piazza San Marco (affording a great view of the square) are filled with Venetian memorabilia – the robes, ducal bonnets and old-maidish nightcaps of the doges; a copy of the statue of Marco Polo from the Temple of Five Hundred Genies in Canton; musical instruments; arms and armour; and a section called ‘Venetian Civilization’ with all sorts of objects from Venetian domestic life – pots and pans and other domestic artefacts, as well as games – a roulette wheel, playing cards, a draughts set, jigsaw, children’s games (a yo-yo), a bingo set, dominoes – all from the 18th century. Among the bric-a-brac, note the pair of 20-inch-high platform shoes called zoccoli or ciapine, the rage among Venetian ladies in the Renaissance, because their increased height allowed them to wear more lavish gowns, even though the wearers could hardly walk (a fact apparently much appreciated by their husbands, as it kept down the risk of infidelities). Upstairs, the picture gallery holds the best collection of Venetian paintings outside the Accademia, including Carpaccio’s Two Venetian Ladies (an essay in total boredom, often called The Courtesans, though in fact all Venetian ladies dressed that way – note their shoes) and his Young Man in a Red Beret, with an archetypal Venetian face. Three of the most important paintings are on the subject of the Pietà, one by Antonello da Messina, painted during his Venetian sojourn in the 1470s, and despite its damaged state, still offering hints of the luminosity that seduced Venetian painters. Another is by Giovanni Bellini and a third by the wiry Ferrarese painter Cosmè Tura. Another section of this floor (often closed) is dedicated to the Risorgimento and Daniele Manin, who led the revolt against Austria in 1848; another holds the 'minor arts' – small bronzes made expressly for collectors by Tullio Lombardo and Il Riccio, lace, household items, and the outstanding Aerial View of Venice by Jacopo de’ Barbari, engraved in 1500, the most accurate view of the city from the period and shown here with the original blocks. Somewhere in the collection, too, is the cat of the battling Doge Francesco Morosini, the same who blew the roof off the Parthenon with a cannonball. Morosini never sailed without his beloved pet, and it was stuffed after its death. If it's back on display, let us know! The museum frequently hosts special exhibitions, when admission might be higher.